600 sqm slab extension over The Star Casino’s main concourse. Extra care required as we were pumping in the public domain past casino patrons. Slab for a new amenities block at a wildlife sanctuary, Eastern Creek. 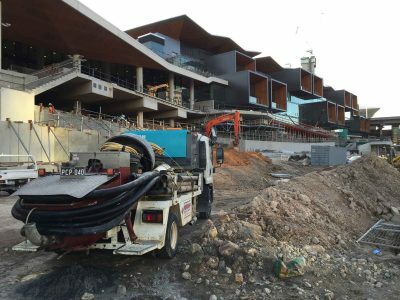 The start of 500 lineal metres of storm water culvert at Sydney’s new Convention Centre, Darling Harbour. 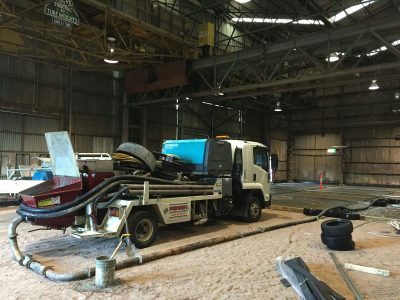 New slab for an extension to 3M’s packaging facilities, utilising an existing old warehouse on site. 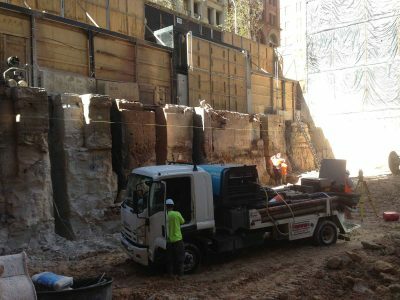 Shotcreting over ground anchors supporting rear laneway, ultimately to facilitate basement excavation into rock. Suspended walkway and associated concrete works at the new Sydney Exhibition Centre, Darling Harbour.